We ordered 4 pizzas, and they were ready right when they said they would be. 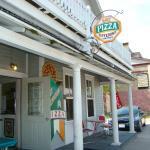 Very friendly staff and great pizza - we loved the spicy chicken! We stopped by to carry a pizza back to our hotel. Cute little shop with picnic tables out front while you wait. Great pizza. The Summer Special was absolutely delicious. The service was great. The price was very reasonable. We loved everything about these pizzas, from the thin crust to the fresh flavorful sauce to the toppings! Next time in town a must stop! They pretty much are a take out only even though they have two tables on their porch. The crust is thin and the toppings are plentiful. Simple pricing make this a no frills pizza joint and if you blink you may miss it. If you like thin crust this is your place. These guys work at getting your order out as quick as the oven can cook it so be patient as good things come to those who wait and it's worth waiting for. Been to Sargent pepperoni's? Share your experiences!